I took this photo as a historical reference to the changing face of Ho Chi Minh City. The city is finally getting a sorely needed metro system and there are numerous blocks in district 1 that are now boarded up in preparation for construction. 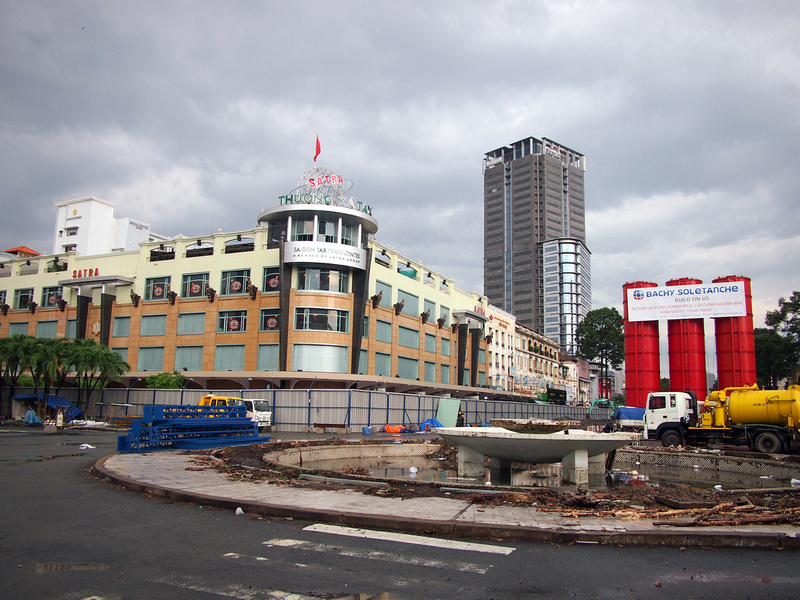 The building in the foreground is the Saigon Tax Trade Centre; a 90 year old building that is soon to be demolished. While the building has gone through so many renovations as to be unrecognizable from its original form, it holds a special place in locals hearts. At Christmas time it becomes the focal point of the city, where the streets are jammed with people coming to look at the christmas displays. The Tax Centre will close down at the end of September in preparation for demolition. In its place will be a 40 storey tower that will be connected to the metro line that is being build in front of it. Many Saigoners I have spoken to are saddened by the loss, even though it means there will be a metro station in its place.